I’m back. I’ve missed you, too. After juggling more plates than I could manage, I confess it was a small relief to hear several crash and splinter around me. Still picking and sorting. Winter was a reminder that, when the show and pizzazz of topside greenery & finery, of fancy & ambition, are lopped by life’s cold shears, it’s always possible to return to one’s working class roots. And so I took a retail job in December, grateful to have gotten an interview, then another, then an offer. I’m working at Staples in Selinsgrove, about a 15-minute drive from home. There’s a Staples in Lewisburg, where we live, but they didn’t offer me an interview (phhhtt!). And the pay, as many of you must know, is staggeringly, mind-blowingly insufficient. I won’t make other comparisons between my former life in academia to my current work week, except to say I thought that, with no essays to grade, I’d be writing more. On the plus side, I have rocketed to my current level of part-time Copy Center Associate, which is a promotion (of sorts) over the level at which I was hired. I was even selected Associate of the Month for February. In short, ladies and gents, I am making lemonade. So. Much. Lemonade. I also thought I’d somehow get ahead of the production schedule over at Seven Kitchens. Uhhh, no. I’m further behind than ever; it’s embarassing. Growing pains of a three-year-old with too-big ambitions? Maybe. Somewhat. But I’m in love with those ambitions (a new series for writers of color; a no-fee open reading period; our long-overdue anthology series; working with co-editors TK and EC). Today at the store I met a young artist who needed to print some work for his portfolio. I was totally blown away by his work–fresh, creative, very insightful, very professional designs. I wished I’d had the budget to hire the guy right on the spot! (Someday, maybe, if I’m lucky and the press continues to grow . . .) Besides, I’m already lucky to have worked with some madly talented artists on our chapbook designs. I really do count my blessings in that regard. So if you’re wondering what’s going on at the press, I’m still here. Our production schedule is seriously out of whack, but I hope to get caught up by the end of summer. How can I help, you ask? Aww, thanks. As soon as I have a couple of hours and a clearer mind, I need to write out a call for volunteers (interns) (whatever you want to call yourselves). I could use help in about a dozen areas–interviewing our authors, updating the Word Press site, researching libraries and other collections, designing chapbook covers, trimming and folding pages, sewing/tying/assembling chapbooks, preparing review copies for mailing–these are just a few off the top of my head. And, of course, you can always buy our chapbooks; they make great gifts for the readers in your life–and shipping is free during National Poetry Month. In which I’m sort of participating, but in a very low-key manner (as opposed to last year’s write-and-post-a-poem-each-day-in-April NaPoWriMo challenge madness). I’m re-reading all of our Seven Kitchens chapbooks, one each day, in the order that they were published, and selecting one line from each to work into a poem. It’s not going all that well, partly because I’m trying to catch up with other, more pressing tasks each evening when I get home from work, and partly because I just feel so tired a lot of the time. But even if I can’t write a poem a day, I’m determined to work through the sequence and see what comes of it. On a somewhat related note (I’ll just toss this out there), is anyone interested in writing a collaborative poem or two? Bearing in mind that my writing schedule is very spotty right now? Hit me up; let’s talk about it. Sadie’s wet nose woke me at 5:30 this morning. I thought it was Saturday evening as I got up, dressed, and headed downstairs to take her for a walk. Apparently, I slept straight through yesterday evening after coming home from work. Mehh, rest is what the body needs sometimes. I know there are anagram generators out there, but I like trying the old school method. First to mind was a pithy spree, which I rather like for its sound, even if it is a bit lispy. Then I arrived at apathy spire and decided I could do no better on this easter Sunday, averse as I am to the mob of christians singing joy, joy, joy every year on this day in the park where Sadie takes her dumps. I do have a great digital cam, a Canon Power Shot S2. It’s about five years old, I think, and it’s the cam that finally seduced me away from David’s old Canon with all the wonderful lenses, tripods, and accessories (which I was happy to pass along to my friend Gretchen last year). I enjoyed working in the darkroom at Bucknell when I taught there and dabbled with the photo club, but for me, digital wins because (a) it’s cheaper, (b) the satisfaction (or chagrin, depending) is pretty much immediate, and (c) I still don’t know what happens, ultimately, to all those photo processing chemicals, some of which I fear might end up in the river. The Canon has a decent macro option, and I find that my preference in photography is for extreme close-up shots of very small objects (or portions thereof) and also, though unrelated, for images that play with shadows and low-light subjects. This one’s blurred by happy accident (Sadie’s leash tug); I think it nicely captures the early-morning, lightly-raining, not-quite-wakeful walk back home. This one is taken from our back yard; I cropped out the neighbor’s house at the end of the alley. A bit of moon through the budding crabapple. 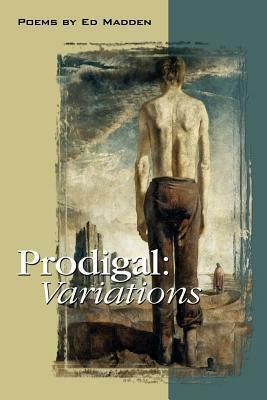 I’m completely in love with Ed Madden’s new book of poems, Prodigal: Variations (from Lethe Press), and have been reading it slowly, one or two poems a day, since it arrived earlier this week. Full disclosure: I published Ed’s chapbook, Nest, in a limited edition of 49 copies last summer. Some of those poems are here, but it’s not for their familiarity that I’m so drawn to this book. It’s simply gorgeous: attentive to detail, personal yet mythical, each poem draws me in quietly but with a sure-footed lyrical eye and ear. A gorgeous collection. Go read this book. update: Here’s a link to Ed talking about his book on Charles Jensen’s web site.